Howard Robard Hughes, Jr. (December 24, 1905 – April 5, 1976) Hughes was an innovative American businessman, movie producer, aircraft inventor, mine owner and casino owner who became infamous in the final years of his life, when he lived as an eccentric recluse. Hughes also gained fame as a record-setting pilot, flying around the world in 1938 in just over 91 hours. However, Hughes's most famous aviation endeavor was building the largest airplane ever made, the Spruce Goose, a giant, eight-engined, flying boat made of wood that flew only once, in 1947. He also established a reputation as a "ladies' man," having dated Ava Gardner and Katharine Hepburn, among many other starlets of the Golden Age of film. In the 1960s, Hughes' business enterprises began to greatly increase his personal wealth to $1 billion, an astonishing sum by era standards. However, certain eccentricities began to dominate Hughes' behavior, and his mental state grew increasingly unbalanced. The reclusive billionaire dropped out of public view, resurfacing to make a telephone call in 1972 to make a statement that a biography written by Clifford Irving was a hoax. Gossip about Hughes' condition, whereabouts, and behavior continued until his death in 1976 and beyond, when a number of parties legally contested his will amid wide media coverage. Hughes was born in Humble, Texas, on September 24, 1905. His parents were Allene Stone Gano Hughes (a descendant of Catherine of Valois, Dowager Queen of England, by her second husband Owen Tudor), and Howard R. Hughes, Sr., who patented the tri-cone roller bit, which allowed rotary drilling for oil in previously inaccessible places. Hughes, Sr. founded Hughes Tool Company in 1909 to commercialize this invention, which made the family wealthy. The younger Hughes grew up under the strong influence of his mother, who was obsessed with protecting her son from all germs and diseases. From his father, Hughes inherited an interest in all things mechanical. At age 12, Hughes was reportedly photographed in the local newspaper as being the first boy in Houston to have a 'motorized' bicycle, which he had built himself. His parents died while he was still in his teens, and Hughes inherited 75 percent of his father's multi-million dollar fortune, which included increasing amounts of cash flow generated from oil drilling royalties. Hughes dropped out of Rice University shortly after his father's death. In June 1925, at age 19, Hughes married Ella Rice, and shortly thereafter they left Houston and moved to Hollywood, where Hughes hoped to make a name for himself making movies. Hughes was at first dismissed by Hollywood insiders as a rich man's son. However, his first film, Everybody's Acting (1927), and his second film,Two Arabian Knights (1928), were financial successes, the latter winning an Academy Award for Best Director of a Comedy Picture. The Racket (1928) and The Front Page (1931) were nominated for Academy Awards. Paul Muni, star of Hughes' 1932 hit movie Scarface. Hughes spent a then unheard-of $3.8 million of his own money to make Hell's Angels, an epic flying film depicting the air battles of World War I over Europe that ultimately became a smash hit after overcoming many obstacles, released in 1930. He produced another hit Scarface in 1930, which was released in 1932, based on the life of Al Capone, the mafia boss, starring Paul Muni. One of his best-known films may be The Outlaw, which made a star of Jane Russell. Scarface and The Outlaw both received considerable attention from industry censors—Scarface for its excessive violence, The Outlaw due to Russell's revealing costumes. Scarface is listed as a "culturally significant" film by the Library of Congress and was selected for preservation in the National Film Registry. Hughes kept his wife isolated at home for weeks at a time and, in 1929, she returned to Houston and filed for divorce. He was also a notorious "ladies' man" who spent time with many famous and glamorous women, including Billie Dove, Katharine Hepburn, Bette Davis, Gene Tierney, Ava Gardner, and Olivia DeHavilland. He proposed marriage to Joan Fontaine several times, according to her autobiography No Bed of Roses. Bessie Love was a mistress during his first marriage. In 1956, Hughes released ''The Conquerer'', considered a tremendous flop and particularly infamous for what was considered a miscasting of American actor John Wayne whose reputation was built on his roles depicting true heroes, as the infamous Genghis Khan. Hughes was a lifelong aircraft enthusiast, pilot, and self-taught aircraft engineer. He set many world records and designed and built several aircraft, himself, while heading Hughes Aircraft. The most technologically-important aircraft he designed was the Hughes H-1 Racer. On September 13, 1935, Hughes, flying the H-1, set the airspeed record of 352 mph over his test course near Santa Ana, California. (The previous record was 314 mph.) A year and a half later, (January 19, 1937), flying a somewhat re-designed H-1 Racer, Hughes set a new transcontinental airspeed record by flying non-stop from Los Angeles to New York City in 7 hours, 28 minutes, and 25 seconds (beating his own previous record of 9 hours, 27 minutes). His average speed over the flight was 322 mph. The H-1 Racer featured a number of design innovations: it had retractable landing gear and all rivets and joints set flush into the body of the plane to reduce drag. The H-1 Racer is thought to have influenced the design of a number of World War II fighter airplanes including the Mitsubishi Zero, the Focke-Wulf FW190 and the F6F Hellcat; although that has never been proven. The H-1 Racer was donated to the Smithsonian in 1975 and is on display at the National Air and Space Museum. On July 10, 1938 Hughes set another record by completing a flight around the world in just 91 hours (3 days, 19 hours), beating the previous record by more than four days. For this flight he did not fly a plane of his own design but a Lockheed Super Electra (a twin-engine plane with a four-man crew) fitted with all of the latest radio and navigational equipment. Hughes wanted the flight to be a triumph of technology, illustrating that safe, long-distance air travel was possible. 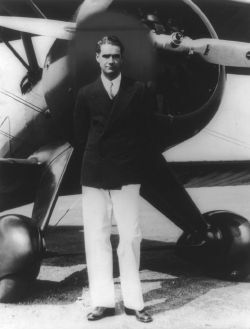 Hughes received many awards as an aviator, including the Harmon Trophy in 1936 and 1938, the Collier Trophy in 1938, the Octave Chanute Award in 1940, and a special Congressional Gold Medal in 1939 "… in recognition of the achievements of Howard Hughes in advancing the science of aviation and thus bringing great credit to his country throughout the world." Hughes checking the first XF-11 prototype. Hughes was involved in a near-fatal aircraft accident on July 7, 1946, while piloting the experimental U.S. Army spy plane XF-11 over Los Angeles. An oil leak caused one of the counter-rotating propellers to reverse its pitch, making the plane yaw sharply. Hughes tried to save the craft by landing it on the Los Angeles Country Club golf course, but seconds before he reached his attempted destination the plane started dropping dramatically and crashed in the Beverly Hills neighborhood surrounding the country club. When the XF-11 finally skidded to a halt after mowing down three houses, the fuel tanks exploded, setting fire to the aircraft and a nearby home. Hughes lay wounded beside the burning airplane until he was rescued by Marine Master Sergeant William L. Durkin, who happened to be in the area visiting friends. The injuries Hughes sustained in the crash—including a crushed collar bone, six shattered ribs, and numerous third-degree burns—affected him for the rest of his life. Possibly his most famous aircraft project was the H-4 Hercules, nicknamed the "Spruce Goose" to his dismay, although its frame was built of birch, not spruce. Hughes built the plane largely from birch rather than aluminum because the contract required the aircraft to be built of "non-strategic materials." The plane was originally contracted by the U.S. government for use in World War II, as a viable way to transport troops and equipment across the Atlantic, instead of sea-going troop transports that were liable to the deadly onslaught of German U-Boats. It was the largest aircraft ever built weighing 190 tons and not completed until just after the end of World War II. The Hercules flew only once, for approximately a mile, with Hughes at the controls, on November 2, 1947. Hughes was summoned to testify before the Senate War Investigating Committee to explain why the plane had not been delivered to the United States Army Air Forces during the war, but the committee disbanded without releasing a final report. The plane was on display alongside the RMS Queen Mary in Long Beach, California for many years before being moved to McMinnville, Oregon, where it is now part of the Evergreen Aviation Museum. Hughes, a native Texan, poses in 1940 with fellow Texan and US Secretary of Commerce Jesse Jones. Hughes Aircraft Company, a division of Hughes Tool Company, was originally founded by Hughes in 1932, in a rented corner of a Lockheed Aircraft Corporation hangar in Burbank, California, to carry out the expensive conversion of a military plane into the H-1 racer. During and after World War II, Hughes fashioned his company into a major defense contractor. The Hughes Helicopters division started in 1947 when helicopter manufacturer Kellett sold their latest design to Hughes for production. In 1948, Hughes created a new division of the company, the Hughes Aerospace Group. The Hughes Space and Communications Group and the Hughes Space Systems Division were later spun off in 1948 to form their own divisions and ultimately became the Hughes Space and Communications Company in 1961. In 1939, at the urging of Jack Frye, president of TWA, Hughes quietly purchased a majority share of TWA stock for nearly $7 million and took control of the airline. 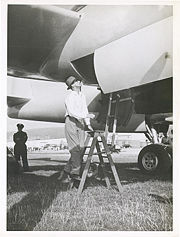 Upon assuming ownership of TWA, Hughes was prohibited by federal law from building his own airplanes. Seeking an airplane that would perform better than TWA's fleet of Boeing 307 Stratoliners, Hughes approached Boeing's competitor, Lockheed. Hughes already had a good relationship with Lockheed since they had built the plane he used in his record flight around the world in 1938. Lockheed agreed to Hughes' demand that the new plane be built in absolute secrecy. The result was the revolutionary Constellation and TWA purchased the first 40 of the new planes off the production line. In 1956, Hughes placed an order for 63 Convair 880s for TWA at a cost of $400 million. Although Hughes was extremely wealthy at this time, outside creditors demanded that Hughes relinquish control of TWA in return for providing the money. In 1960, Hughes was ultimately forced out of TWA, although he still owned 78 percent of the company and battled in court to regain control. In 1966, he was forced by a U.S. Federal Court to sell his shares in TWA due to concerns over conflict of interest between his ownership of both TWA and Hughes Aircraft. The sale of his TWA shares netted him a profit of $547 million. During the 1970s, Hughes went back into the airline business, buying the airline Air West and renaming it Hughes Airwest. In 1948, Hughes gained control of RKO, a struggling major Hollywood studio, by acquiring 25 percent of the outstanding stock. RKO was already reeling under scandals resulting from two of its top talents, director Edward Dmytryk and producer Adrian Scott, being exposed as leftist (communist) sympathizers and being "blacklisted" as members of the so-called Hollywood Ten. Hughes faired far worse as a studio owner than he had as a movie producer two decades earlier. Within weeks of taking control, Hughes dismissed three-quarters of the work force, and production was shut down for six months in 1949 while he undertook the investigation of the politics of all remaining studio employees, fearing Communist infiltration. Completed pictures would be sent back for reshooting if he felt his star (especially female) was not properly presented, or if a film's politics were too left-leaning in his opinion. By the end of 1954, at a cost of nearly $24 million, Hughes had gained near total control of RKO, becoming closer to being a sole owner of a studio than anyone in Hollywood for more than three decades. Six months later, Hughes sold the studio to the General Tire and Rubber Company for $25 million. He retained the rights to pictures he had personally produced, including those made at RKO. He also retained Jane Russell's contract. For Howard Hughes, this was the virtual end of his 25-year involvement in motion pictures. Vilified in Hollywood for his anti-communism, many believe he had severely harmed RKO. Others believe he saved the company from nearly sure death, and his reputation as a financial wizard emerged unscathed. He reportedly walked away from RKO having made $6.5 million in personal profit. In 1953, Hughes gave all his stock in the Hughes Aircraft Company to the newly formed Howard Hughes Medical Institute in Chevy Chase, Maryland, thereby turning the aerospace and defense contractor into a tax-exempt charity. The Howard Hughes Medical Institute sold Hughes Aircraft in 1985 to General Motors for $5.2 billion. The deal was the topic of a protracted legal battle between Hughes and the Internal Revenue Service, which Hughes ultimately won. After his death in 1976, many thought that the balance of Hughes' estate would go to the institute, although it ultimately was divided among his cousins and other heirs, given the lack of a legal will to the contrary. The Howard Hughes Medical Institute is America's second largest private foundation and the largest devoted to biological and medical research, with an endowment of $16.3 billion as of June 2007. Two Institute researchers, Richard Axel and Linda Buck, won the Nobel Prize in Physiology or Medicine 2004 for their work. Despite an increasingly reclusive lifestyle, in the late 1960s Hughes became involved in a secret operation with the US Government involving the development of a deep sea mining barge, the Glomar Explorer. Ostensibly built to recover manganese nodules off the ocean floor, the ship was used in an attempt to recover the Soviet submarine K-129, which had been lost in deep water in April 1968. The Hughes Glomar Explorer. as the ship was called at the time, was built between 1973 and 1974 at a cost in excess of $350 million. It set sail on June 20, 1974. While the ship did recover a portion of the vessel, a mechanical failure in the grapple caused half of the submarine to break off during recovery. This lost section is said to have held many of the more sought after items, including the code book and nuclear missiles. It was subsequently reported that two nuclear-tipped torpedoes and some cryptographic machines were recovered, along with the bodies of six Soviet submariners, who were subsequently given a formal burial at sea. The top-secret operation, code-named Project Jennifer, became public in February 1975 when the Los Angeles Times published a story about it, followed by news stories with additional details in other publications. In September of 1978, a consortium called Ocean Minerals Company of Mountain View, California announced that it had leased the Hughes Glomar Explorer and would begin testing a prototype deep sea mining system in the Pacific Ocean. The consortium included subsidiaries of the Standard Oil Company of Indiana, Royal Dutch Shell, and Bos Kalis Westminster Group NV of the Netherlands. Another partner, and the prime contractor, was the Lockheed Missile and Space Company. In 1997, the ship was taken to Hunters Point Naval Shipyard for modifications that converted it to a dynamically-positioned deep sea drilling ship. The conversion was the start of a 30-year lease from the U.S. Navy to Global Marine Drilling. Global Marine merged with Santa Fe International Corporation in 2001 to become GlobalSantaFe Corporation, which now operates the vessel. By the late 1950s, if not earlier, Hughes had developed debilitating symptoms of obsessive-compulsive disorder (OCD). Once one of the most visible men in America, he ultimately vanished from public view altogether, although the tabloids continued to follow rumors regarding his behavior and whereabouts. On January 12, 1957, Hughes married Jean Peters, whom he had known for several years. His second marriage was troubled; much of the contact between husband and wife was by phone. At various times, the media reported him to be terminally ill, mentally unstable, or possibly dead. Although Hughes lived in his own home in California for many years, he later came up with the idea of living in hotels, as this enabled him to not have a legally-declared residence in any state which would require him to pay personal income taxes. However, shortly after this, legislation was passed that any person living in a state 180 days or longer was subject to personal income tax during that time period in that state. Hughes eventually became a complete recluse, locking himself in darkened rooms in a medication-induced daze. Though he always kept a barber on call, Hughes only had his hair cut and nails trimmed about once a year. Several doctors were kept in the house on a substantial salary, but Hughes rarely saw them and usually refused to follow their advice. Toward the end of his life, his inner circle was largely composed of members of the Church of Jesus Christ of Latter Day Saints (Mormons) because he considered them trustworthy, even though Hughes himself was not a member of the LDS church. By this time, Hughes had become severely addicted to codeine, Valium, and a number of other prescription drugs and was becoming increasingly frail. He insisted on using paper towels to pick up objects, so that he could insulate himself from germs. Hughes had also contracted syphilis as a young man, and much of the strange behavior at the end of his life has been attributed by modern biographers to the tertiary stage of that disease. The condition first manifested itself in the form of tiny blisters that erupted on his hands. After receiving medical treatment for his symptoms, Hughes was warned by his doctor not to shake hands for some time, so he avoided doing so for the rest of his life. In 1971, Jean Peters filed for divorce; the two had not lived together for many years. Peters requested a lifetime alimony payment of $70,000 a year, adjusted for inflation, and waived all claims to Hughes' estate. Hughes offered her a settlement of over a million dollars, but she declined it. Hughes did not insist upon a confidentiality agreement from Peters as a condition of the divorce; aides reported that Hughes never spoke ill of her. She refused to discuss her life with Hughes and declined several lucrative offers from major publishing companies and biographers. Peters would state only that she had not seen Hughes for several years before their divorce, because his psychological problems forced him to stay in a separate room, talking with her only by phone. In 1972, author Clifford Irving created a media sensation when he claimed to have co-written an authorized autobiography of Hughes. Hughes was such a reclusive figure that he did not immediately publicly refute Irving's statement, leading many people to believe Irving's book was a genuine autobiography. Before the book's publication, however, Hughes finally denounced Irving in a teleconference and the entire project was eventually exposed as a hoax. Irving was later convicted of fraud and spent 17 months in prison. The 2007 film The Hoax, starring Richard Gere, was based on those events. 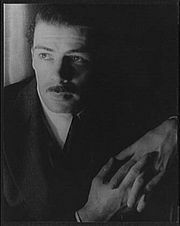 Hughes died on April 5, 1976, while on an airplane owned by Robert Graf, en route from his penthouse in Acapulco, Mexico to The Methodist Hospital in Houston. It has also been argued that he died before leaving Mexico. His reclusive activities and drug use had made him practically unrecognizable; his hair, beard, fingernails, and toenails had grown grossly long, his once-strapping 6-foot, 4-inch frame now weighed barely 90 pounds, and the FBI had to resort to fingerprints to identify the body. A subsequent autopsy noted kidney failure as the cause of death. Hughes was in extremely poor physical condition at the time of his death; X-rays revealed broken-off hypodermic needles still embedded in his arms and severe malnutrition. The first doctor to examine him diagnosed the cause of Hughes' death as neglect. While his kidneys were damaged, his other internal organs were deemed perfectly healthy. Hughes is buried in the Glenwood Cemetery in Houston. Approximately three weeks after Hughes' death, a handwritten will was found on the desk of an official of The Church of Jesus Christ of Latter-day Saints in Salt Lake City, Utah. The so-called "Mormon Will" gave $1.56 billion to various charities (including $625 million to the Howard Hughes Medical Institute); nearly $470 million to the upper-management in Hughes' companies and to his aides; $156 million to first cousin William Lummis; $156 million split equally between his two ex-wives Ella Rice and Jean Peters; and $156 million to a gas-station owner named Melvin Dummar. Dummar initially denied any knowledge about the will, but changed his story when his fingerprints were found on the envelope containing the will. Dummar told reporters that late one evening in December 1967, he found a disheveled and dirty man lying along U.S. Highway 95, 150 miles north of Las Vegas. The man asked for a ride to Las Vegas. Dropping him off at the Sands Hotel, Dummar said the man told him he was Hughes. Dummar then claimed that days after Hughes' death, a "mysterious man" appeared at his gas station, leaving an envelope containing the will on his desk. Unsure if the will was genuine, and unsure of what to do, Dummar left the will at the LDS Church office. In a trial lasting seven months, the Mormon will was eventually rejected by the Nevada court in June 1978 as a forgery. The court declared that Hughes had died intestate. Hughes' $2.5 billion estate was eventually split in 1983 among 22 cousins, including William Lummis who serves as a trustee of the Howard Hughes Medical Institute. Dummar was largely discounted by the public as a phony and an opportunist. In 1984, Hughes' estate paid an undisclosed amount to actress Terry Moore, who claimed to have been secretly married to Hughes on a yacht in international waters off Mexico in 1949 and never divorced. Another will also filed for probate in Clark County, Nevada, left $400 million to a man identified as Hughes' son, named Dwayne Clyde Byron Hughes. Howard Hughes left behind an impressive record of diverse accomplishments that still affect American culture and life. As a filmmaker, he produced several critically acclaimed works of the Golden Era of Film, including Two Arabian Knights (1928), which won an Academy Award for Best Director of a Comedy Picture; The Racket (1928) and The Front Page (1931), both nominated for Academy Awards; and Scarface and Hell's Angels, which were smash hits in 1930. One of his best-known films is The Outlaw, which made a star of Jane Russell. Scarface is listed as a "culturally significant" film by the Library of Congress and was selected for preservation in the National Film Registry. Despite being vilified by Hollywood for his anti-communism, Hughes was also able to keep the struggling RKO afloat during a tumultuous period at the motion picture studio. The billionaire left even more of a mark in aviation than he did in film. A lifelong aircraft enthusiast, pilot, and self-taught aircraft engineer, Hughes set many world records and designed and built several, technologically advanced aircraft himself, the ill-fated Spruce Goose, while heading Hughes Aircraft. The company began with the expensive conversion of a military plane into the H-1 racer, but later, during and after World War II, he turned into a major defense contractor. The Hughes Helicopters division started in 1947 and created generations of air-combat vehicles. Hughes also created the Hughes Aerospace Group, the Hughes Space and Communications Group, and the Hughes Space Systems Division, which were later combined to become the Hughes Space and Communications Company in 1961. Perhaps Hughes biggest contribution to American society was his donation of all his stock in Hughes Aircraft to the newly formed Howard Hughes Medical Institute in Chevy Chase, Maryland, thereby turning the aerospace and defense contractor's major assets into a tax-exempt charity. In 1985, the Howard Hughes Medical Institute sold Hughes Aircraft to General Motors for $5.2 billion. After the Bill and Melinda Gates Foundation, the Howard Hughes Medical Institute is America's second largest private foundation and the largest devoted to biological and medical research, with an endowment of $16.3 billion as of June 2007. Hughes is most famous for the solitary and compulsive years that preceded his death. However, if it had not been for his major accomplishments as an movie maker, aviator, entrepreneur, and philanthropist, his fame as an eccentric would never have existed. A biography at Famoustexans.com. www.famoustexans.com. FAS Intelligence Resource Program Project Jennifer Hughes Glomar Explorer.